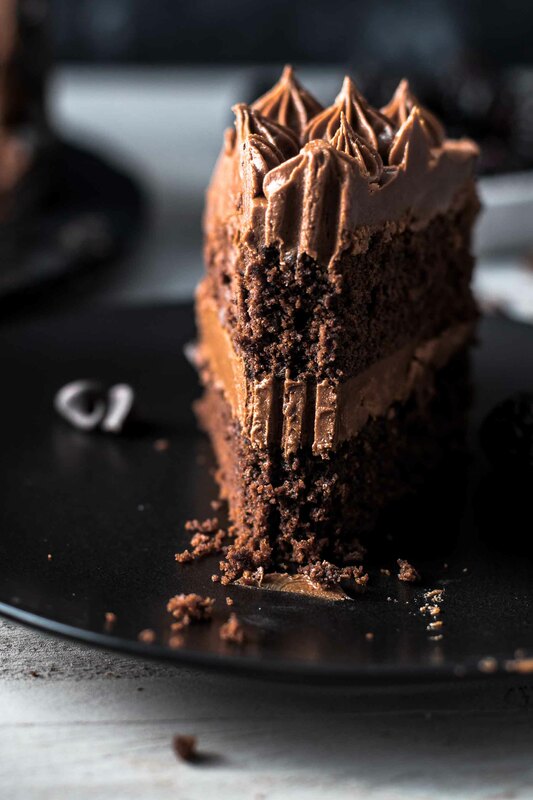 This Triple Chocolate Cake is super soft and moist and intensely chocolatey — the perfect cake for everyone who loves a delicious chocolate cake. 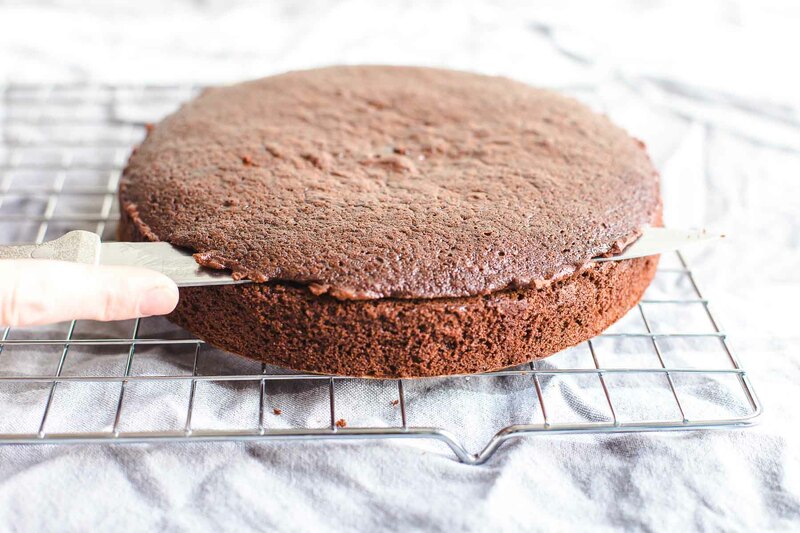 The chocolate cake is made with oil for super moist cake layers. 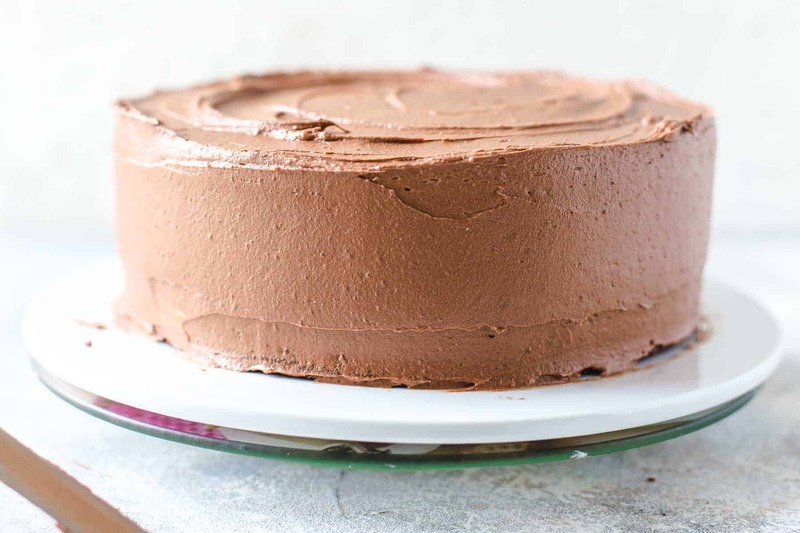 The chocolate buttercream is made with only 3 ingredients and is beyond creamy. Decorated with lots of chocolate chips. It’s easy to make, and you need just 25 minutes of hands-on preparation time. Detailed step-by-step instructions including photos and video provided. 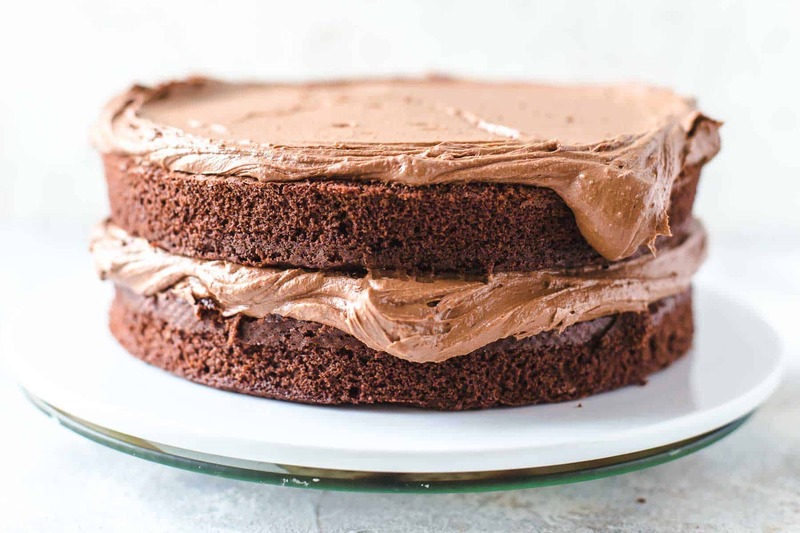 This Triple Chocolate Cake is a simple and straightforward chocolate cake recipe. The chocolate cake is made with oil instead of butter to have super moist and delicious chocolate cake layers. 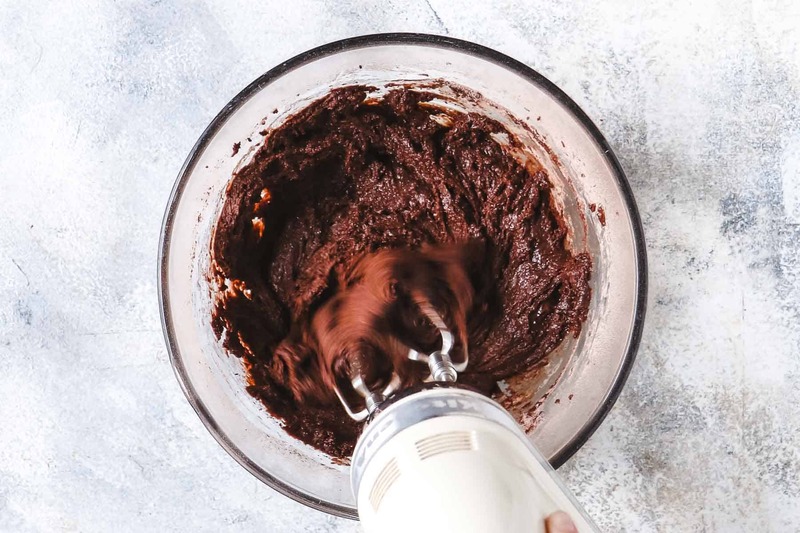 For the best chocolate frosting, please be sure to use just high-quality chocolate. Choose a semi-sweet (dark) chocolate of a brand you love. The taste of the chocolate affects the taste of the frosting. I love brands like Lindt, Ghirardelli, or Hershey’s. Let’s start with the cake. Combine all dry ingredients in a medium bowl. These are flour, cocoa, sugar, baking powder, salt, and espresso powder. 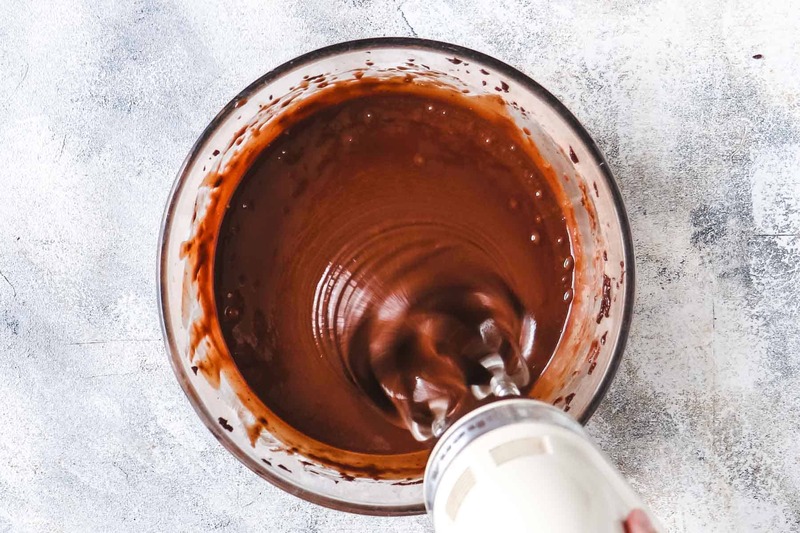 In a large bowl, using a handheld or stand mixer fitted with a whisk or paddle attachment, combine all wet ingredients on medium-low speed. These are oil, eggs, buttermilk, and vanilla. Stir just until combined. Then add the dry ingredients and mix until combined. Slowly mix in hot water and stir just until combined. The water should be hot boiling. Please take care that you don’t burn yourself. The chocolate cake batter will be very thin. 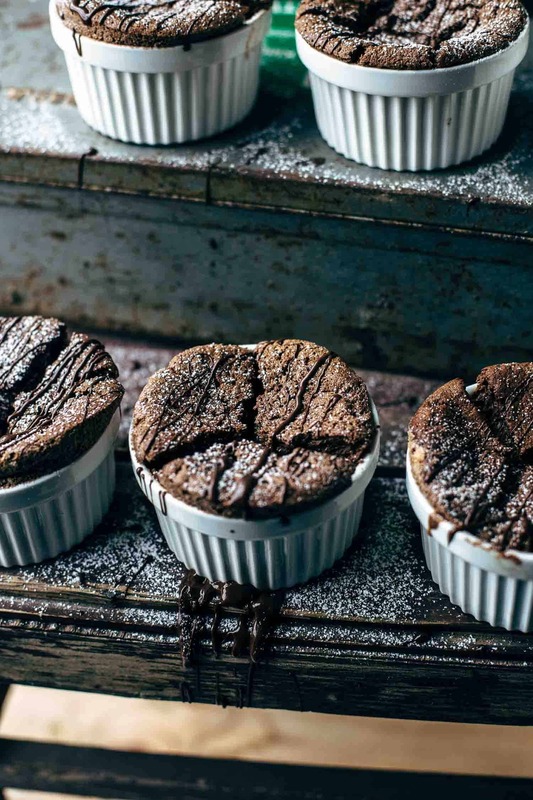 Line the bottom and the sides of two 8″ (20cm) baking pans with parchment paper. Therefore cut out circles for the bottoms and stripes for the sides. Spray a bit of baking spray underneath the stripes that it sticks to the sides. I found out that lining also the sides with parchment makes it super easy to remove the cake from the pan without adding any additional fat or moisture to the sides of the cake. Fill the cake batter into the two baking pans equally. Use a kitchen scale for the most accurate results. If you measure the pans, you can be sure that your cake layers will be equal in size and texture. Bake at 350°F / 175°C for 20-25 minutes. 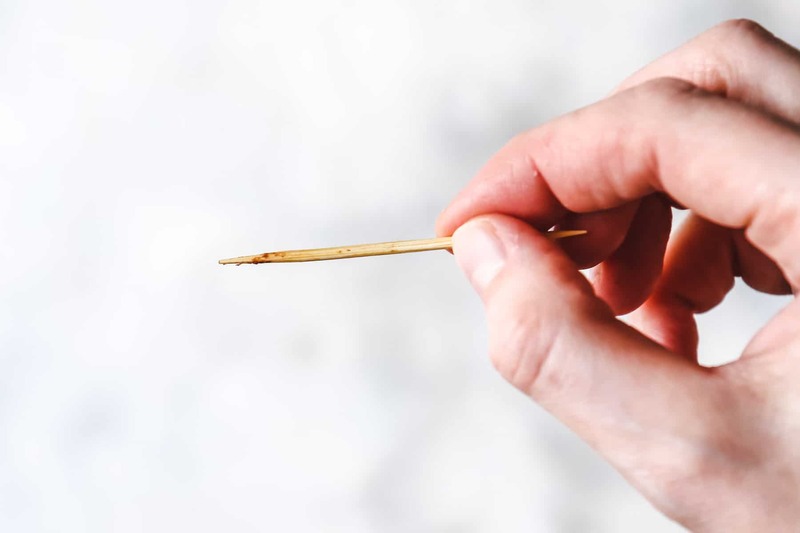 A toothpick centered in the middle should come out clean with a few cake crumbs on it. I bake mine for 22 minutes. 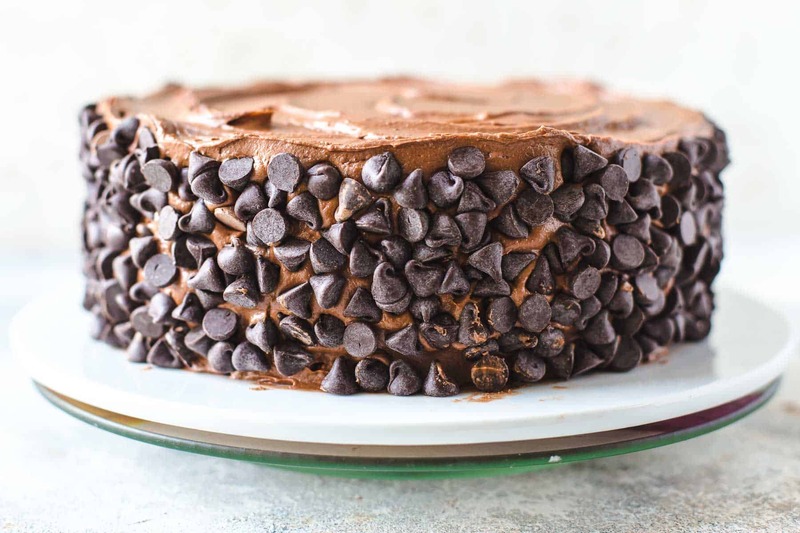 It’s crucial to have the right oven temperature for perfectly baked chocolate cake layers. Therefore I can’t recommend enough to invest in an oven thermometer. I did a test. I removed my oven thermometer and completely relied on my oven dial. I turned to 350°F and baked the cake 22 minutes. As you can see in the picture below it was a complete fail. Totally overbaked. The tops cracked and split from the cake, and I got lots of holes throughout the cake. Why did this happen you ask? Because my oven temperature is not accurate. 350°F on my oven dial is 375°C for real. A success! Even tops, no huge holes. Just perfect. So please make sure to use an oven thermometer to avoid such problems. Okay, let’s move on with the recipe. After baking, let the cake layers cool down for 15-20 minutes. Then remove from the pans and transfer to a cooling rack. Let cool completely. Meanwhile, make the chocolate frosting. It can’t be easier. 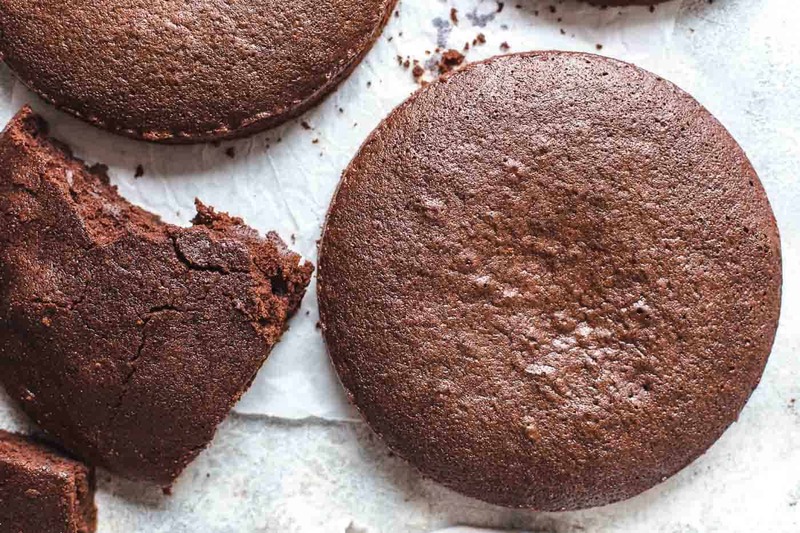 You need just 3 ingredients: butter, powdered sugar, and chocolate. 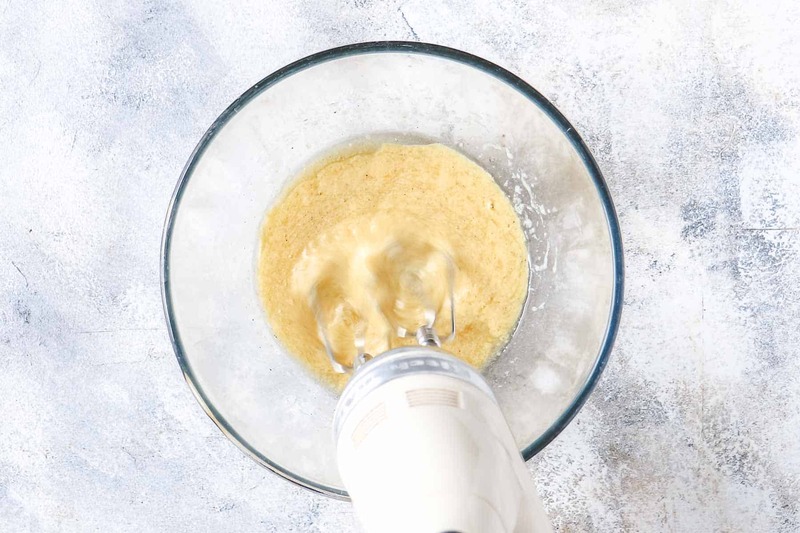 Mix butter with a handheld or stand mixer fitted with a whisk attachment on medium speed until very creamy. About 2 minutes. The butter needs to be room temperature. Cold butter doesn’t mix that well, and you need to mix significant longer to make it creamy. Sift in powdered sugar and mix until creamy and combined. Add melted chocolate and mix until smooth and creamy. Please don’t add hot chocolate. The chocolate should cool down for about 10 minutes before you add it to the butter. But it should be still liquid though. It’s time to assemble the cake. Therefore, cut a thin layer off the tops of your cakes to create a flat surface. Then place one cake layer on a cake stand, turner, or serving plate. Remove about 1/2 cup of frosting for decoration. Spread the half of the remaining frosting over the cake. Then place the second cake layer on top and spread the remaining frosting over the cake and frost the outside and the sides of the cake. Decorate with chocolate chips and the reserved frosting. I transferred the reserved frosting to a piping bag fitted with a Wilton 32B tip and piped it on top of the cake. Chill at least 3 hours in an airtight container in the fridge. Cake slices are best eaten at room temperature. Therefore place it on the kitchen counter 15-30 minutes before serving. Do not overmix the batter. Just stir to combine at every step. Measure flour correctly. Spoon the flour into the measuring cup and level with the back of a knife. A packed cup of flour equals 1.5x times the required amount of flour. Measure and divide batter into the two pans equally that they are baked through at the same time. Don’t overbake the cake. Remove when a toothpick in the center comes out clean. 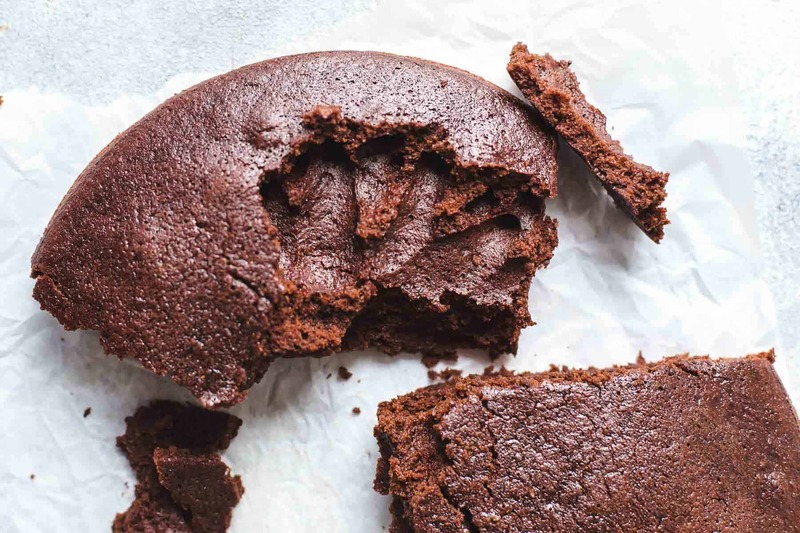 This chocolate cake calls for dutch-processed cocoa powder and baking powder. 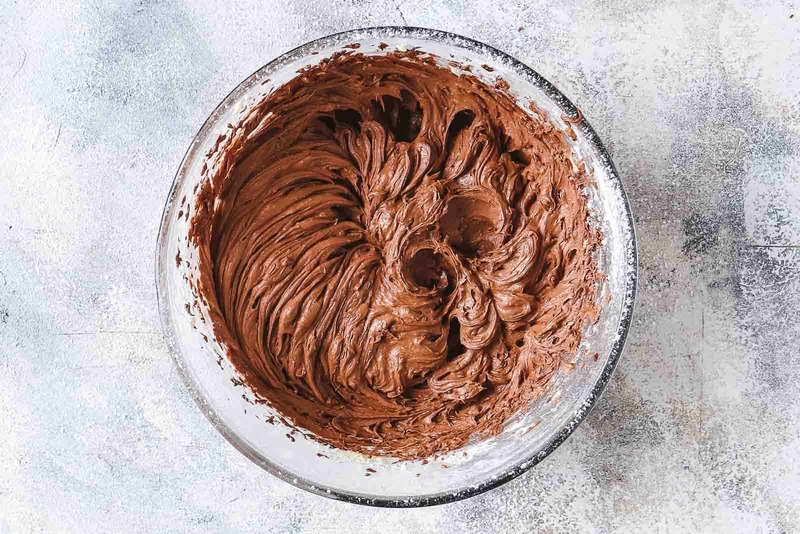 If you want to substitute with natural unsweetened cocoa powder, then substitute the dutch-processed cocoa powder 1:1. Instead of 1 tbsp of baking powder, use 1+1/2 tsp baking powder and 1+1/2 tsp of baking soda. 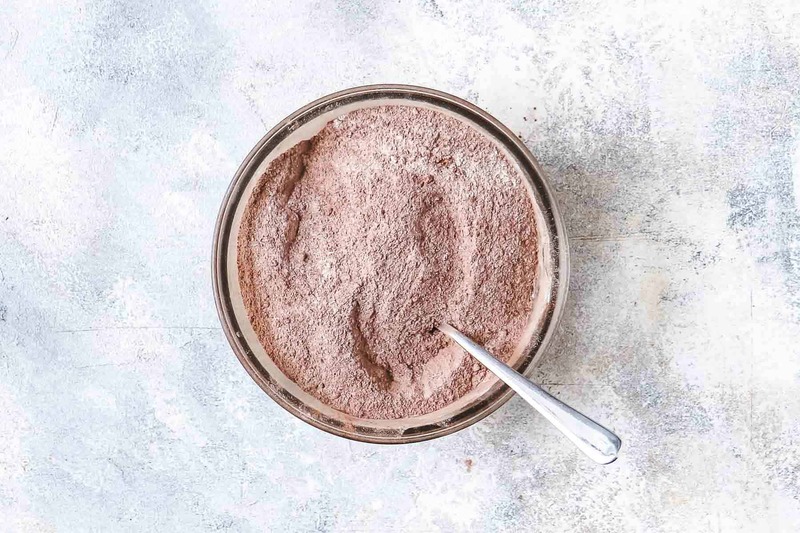 Natural cocoa powder needs baking soda to react, and dutch-processed cocoa powder needs baking powder. I added 1 tsp of espresso powder to the cake batter to enhance the chocolate flavor. No worries. You won’t taste the coffee. But if you really don’t want to add the espresso powder, then just leave it out. For gluten-free chocolate cake, I recommend using Bob’s Red Mill Gluten Free 1:1. 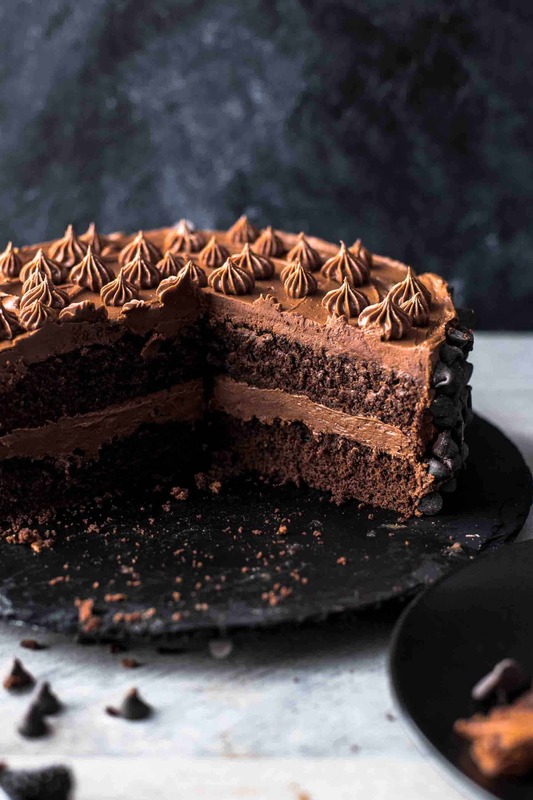 How long does Triple Chocolate Cake last? If stored in the fridge, up to 4 days. If stored at room temperature, up to 3 days. I recommend storing the cake in the fridge. 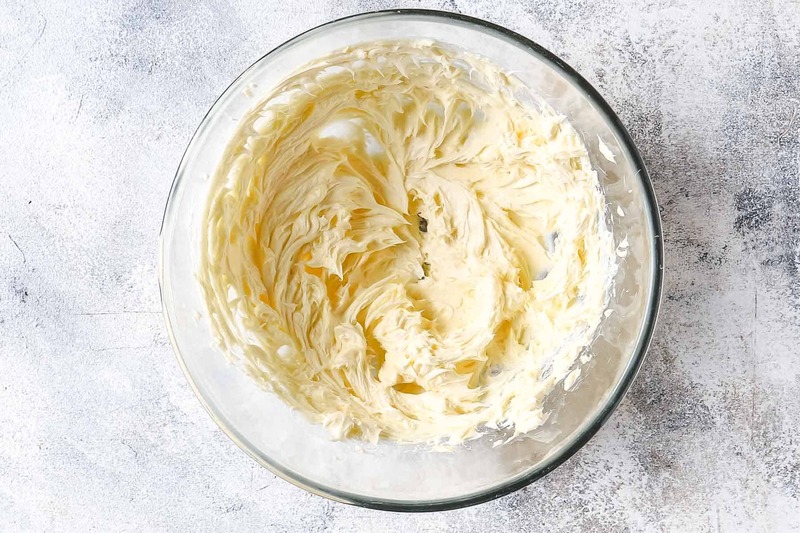 If it is too warm and humid in your climate zone, the buttercream could get too soft and greasy. 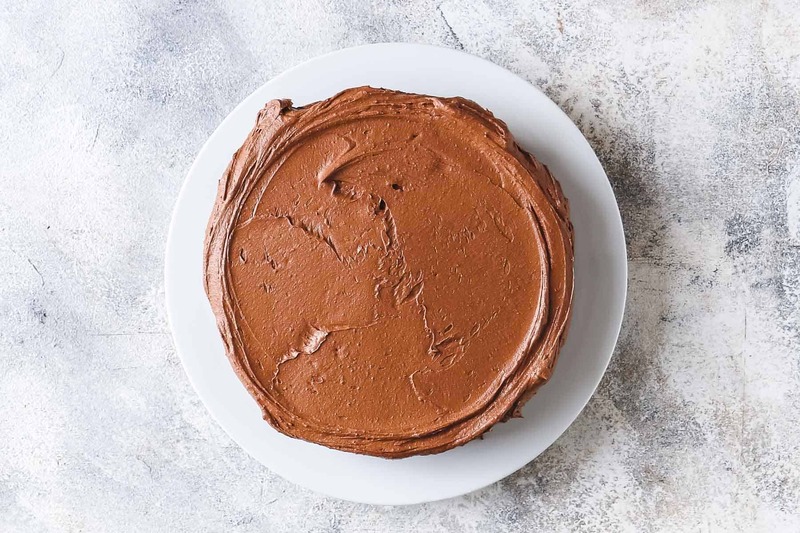 Can I freeze Chocolate Cake? Absolutely. This cake freezes very well. The whole cake: After chilling for 3 hours, place the Triple Chocolate Cake in the freezer until it is firm, for about 2 hours. Remove the cake from the freezer and tightly wrap in plastic foil twice. Make sure that everything is covered. Then wrap two layers of tin foil around until completely covered. It freezes well up to 2 months. Unwrap the cake and thaw in the fridge overnight. Eat within 2 days. Single slices: Place the slice in the freezer for about 1 hour. Then remove from the freezer and tightly wrap in plastic foil twice, until fully covered. Place in a freezer bag and remove as much air as possible. It freezes well up to 2 months. For thawing, unwrap the cake and place on the kitchen counter for 1-2 hours. Eat within 1 day. Just the cake layers: After baking the cake layers, remove the paper and let cool completely. Then tightly wrap each cake layer in plastic foil twice. Place in freezer bags and remove as much air as possible. Freeze up to 1 month. For thawing, unwrap the cake layers and let sit on the counter for about 1-2 hours. Once it is room temperature, make the frosting and assemble the cake as described. 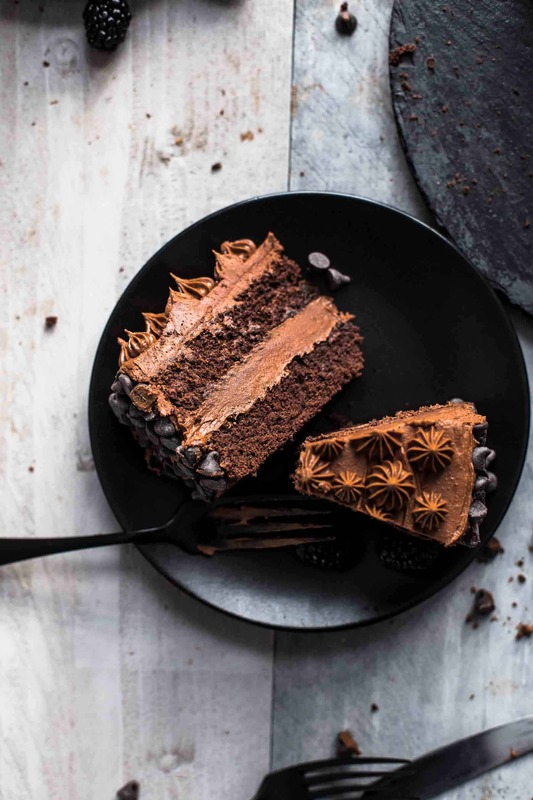 If you make this Triple Chocolate Cake recipe, leave a comment, rate it and tag a photo #alsothecrumbsplease on Instagram! Would love to see your snap! 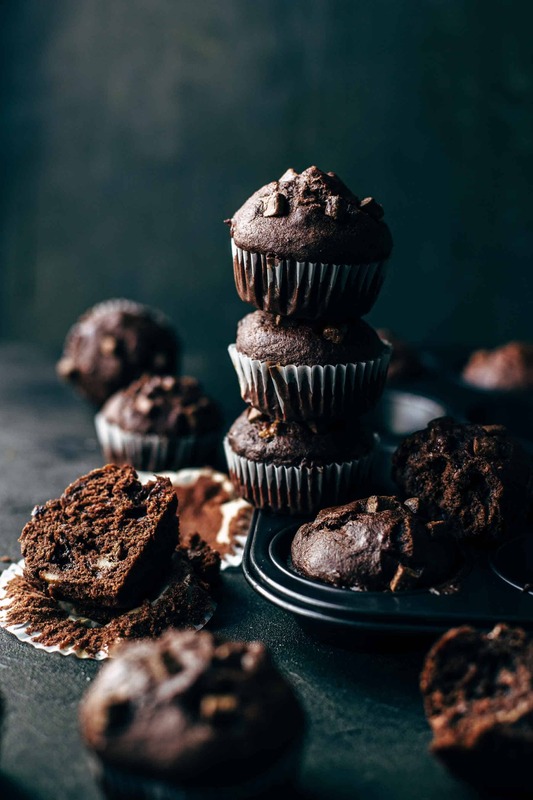 You may also like Chocolate Easter Eggs Cake with Chocolate Marshmallow Frosting, White Chocolate Mousse Chocolate Eggs + Video, Soft and Moist Chocolate Banana Muffins, Easy Chocolate Soufflé Recipe, or click here to see all chocolate recipes. 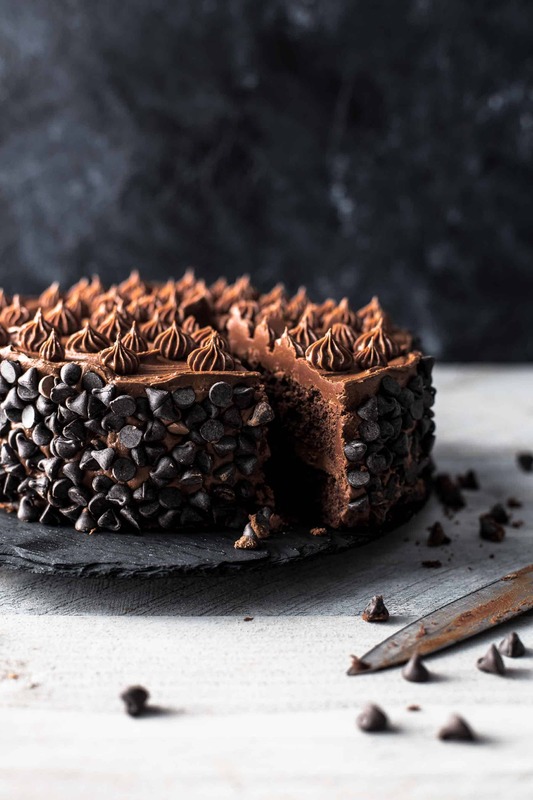 If you are a chocoholic, this soft and moist Triple Chocolate Cake recipe is made for you. Expect three times intense chocolate taste. 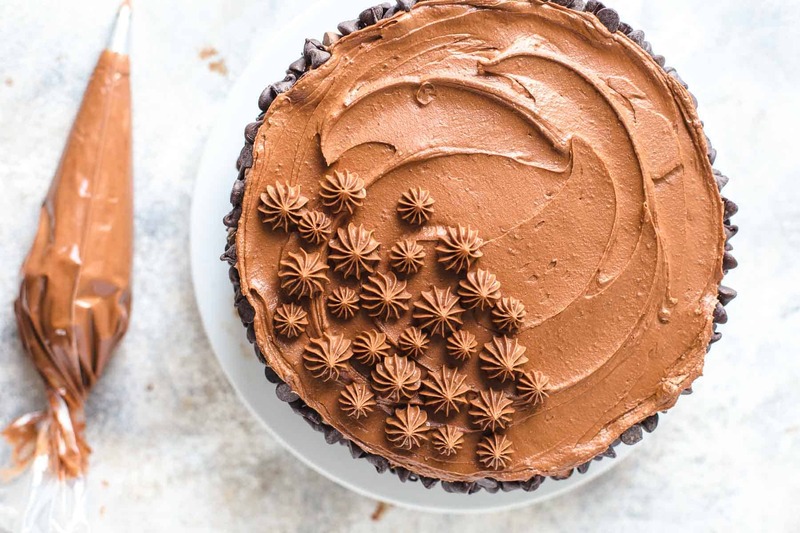 Moist chocolate cake - amazing chocolate buttercream frosting -chocolate sprinkles on top. Very easy to make. 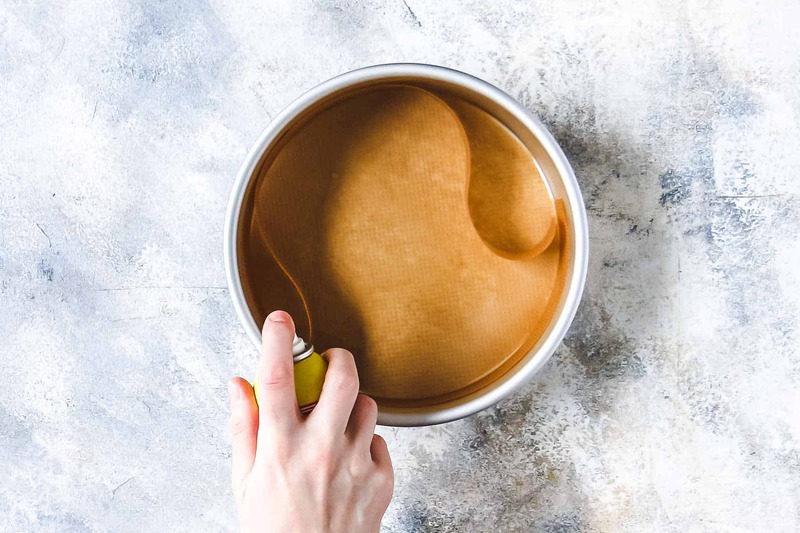 Make the cake: In a medium bowl combine flour, cocoa, sugar, baking powder, salt, and espresso powder and stir to combine. Set aside. 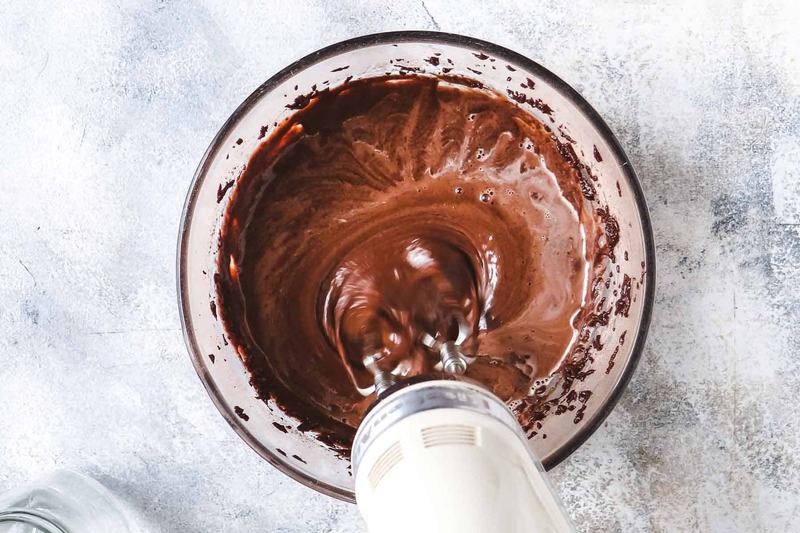 In a large mixing bowl with a stand or handheld mixer fitted with a whisk or paddle attachment, beat oil, eggs, buttermilk, and vanilla* just until combined. Stir in dry ingredients to combine. Slowly mix in hot water until combined. Be cautious that you don't burn yourself! The batter will be very thin. 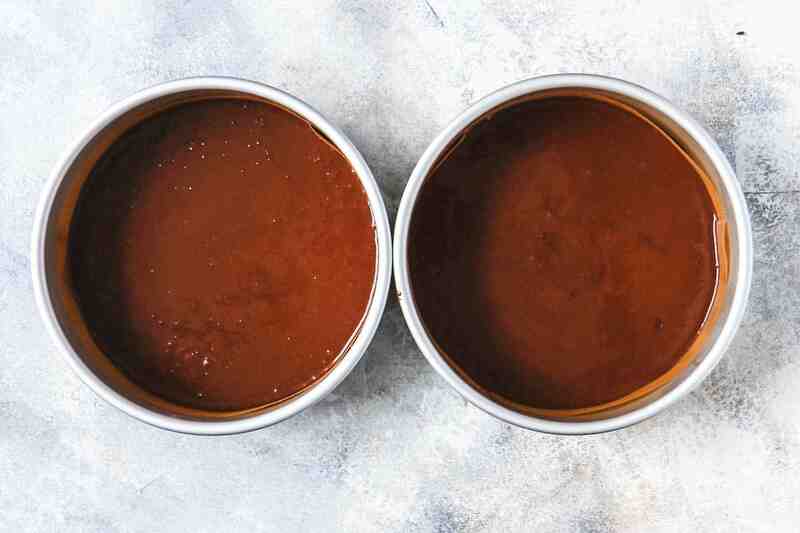 Divide batter into the two prepared baking pans equally. Bake for 20-25 minutes or until a toothpick in the center comes out clean. Don't overbake. I baked mine for 22 minutes. Let cool in the pan for about 15 minutes. Then remove from pan and transfer to a cooling rack. Let cool to room temperature. 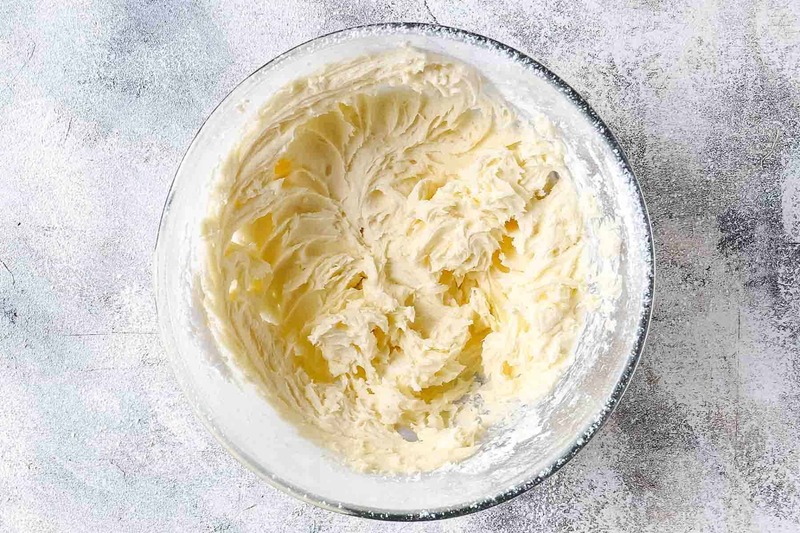 Make the frosting: Mix butter until creamy. Add powdered sugar and mix until combined. 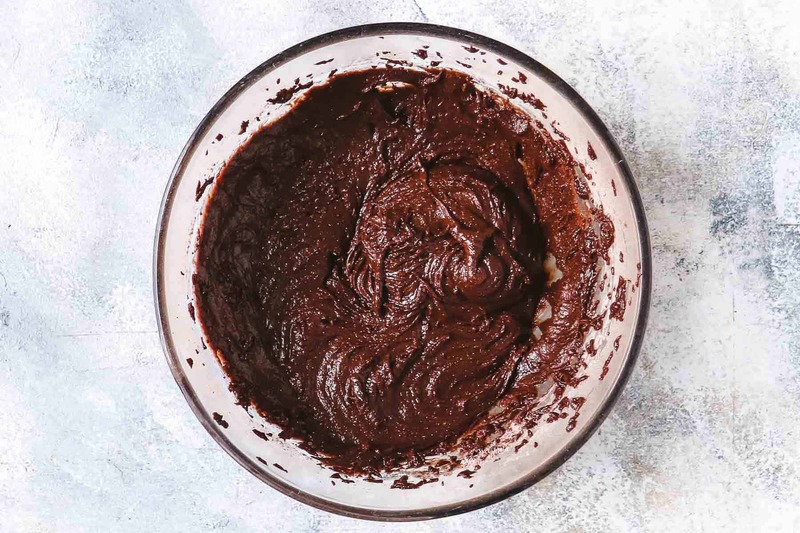 Stir in melted chocolate until creamy. The melted chocolate shouldn't be hot. After melting, let stand 10 minutes. 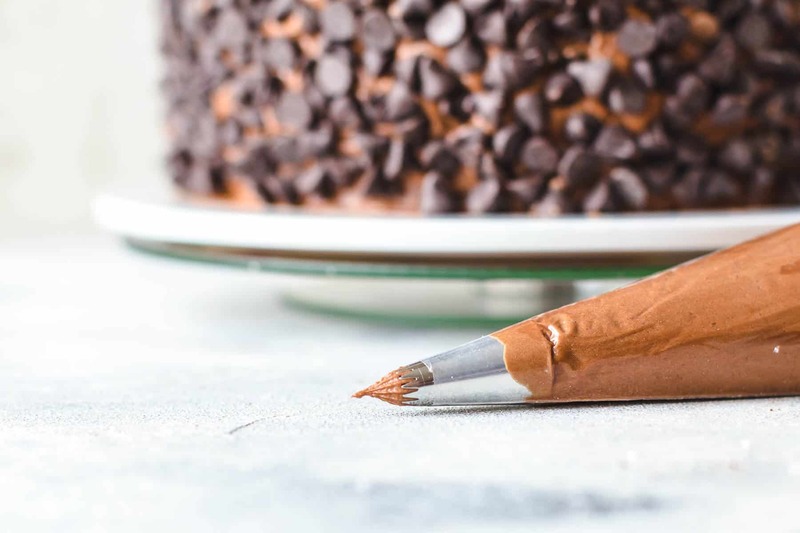 Cut a thin layer off the tops of your cakes to create a flat surface. 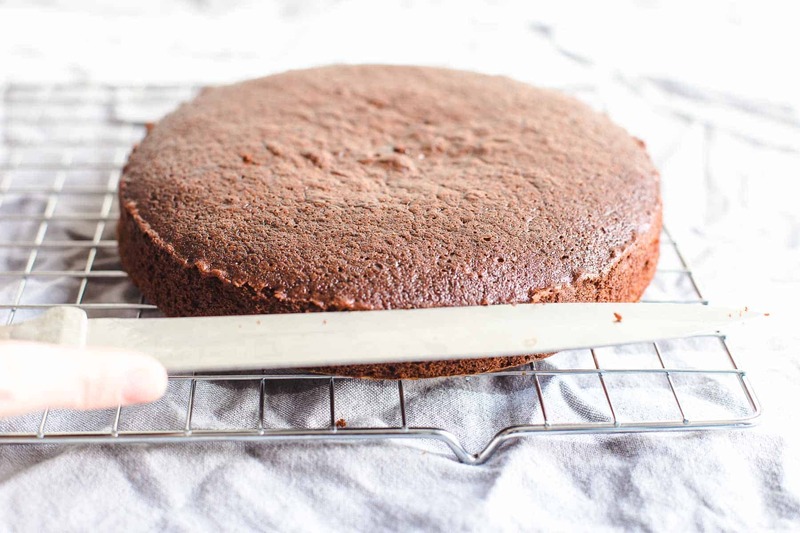 Place one cake layer on a cake stand, turner or serving plate. Remove 1/2 cup of the frosting for decoration. Spread the half of the remaining frosting over the cake. Place the second cake layer on top and frost the outside and the sides of the cake with the remaining frosting. Decorate with chocolate chips and the reserved frosting. Chill in an airtight container in the fridge for at least 3 hours. Leftovers will stay fresh up to 4 days. Let cake come to room temperature before serving. Read the blog post for additional information on how to make Triple Chocolate Cake, tips for super moist chocolate cake, how to store and freeze chocolate cake, substitutions, etc. Watch step-by-step photos to see the required consistency at every step. Watch the 78 seconds video to see the whole process of making Triple Chocolate Cake. Thanks, Albert! I thought this is just a myth that people are existing which are no chocoholics. 😉 But I’m sure you would love this cake anyway. I need this in my life! This is absolutely gorgeous! Thank you so much, Sonya. I’m happy that you like it as much as I do. Cake flour or regular flour? This is Raushan from Indian and I run an online cake shop in Delhi. 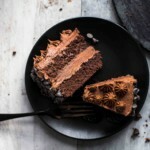 A moist chocolate cake is my all time favorite and I love making a variety of cakes. This cake looks amazing. Perfectly baked. Good job. Hi Raushan, thank you so much for your professional opinion! Thank you for this AMAZING recipe! This is by far my most favorite recipe from Pinterest! Chocolate chocolate chocolate, This looks lovely and I’m going to try it. Yay, three times chocolate! I hope you like it! I want to be like you, a super cook. What a perfect and delicious cake. Thank you so much, Edvaldo! I’m very happy that you like the cake! Hey ! the cake looks so yummy ???????? HI this cake looks delicious! Hi, yes powdered sugar, confectioners sugar, and icing sugar are all the same. Just different terms for very fine sugar. This is Lei from Indian and I run an online cake shop in Delhi. 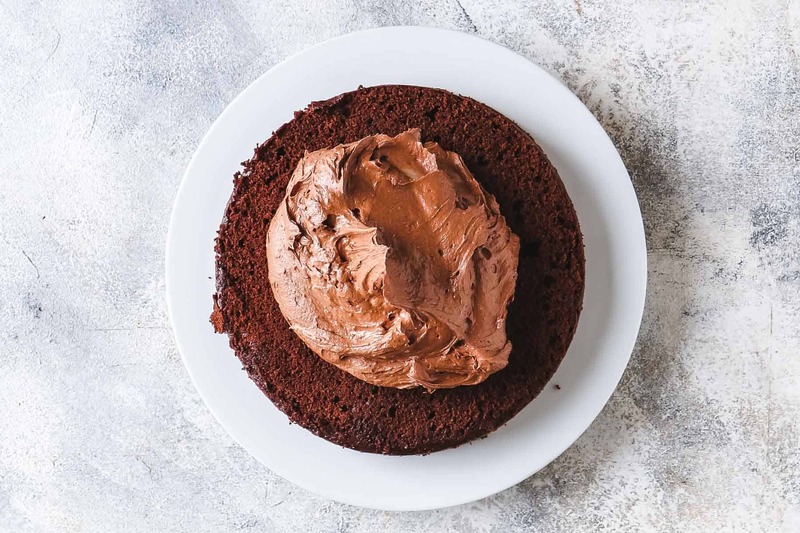 A moist chocolate cake is my all time favorite and I love making a variety of cakes. This cake looks amazing. Perfectly baked. Good job. Thank you so much, Lei! I’m happy that you like it. Chocolate is my favorite too. I’m happy that the cake turned out well and you liked it. Thank you for the feedback. Happy birthday! Thank you so much! In this case, you’re going to love it! Yes, all-purpose flour is plain flour. Do you have to put espresso powder in it? No, you can leave it out if you don’t like it.